Until I read about it on Sarah’s blog, I wasn’t sure what a meme was. Now I realize it’s one of those things that sweeps across the Internet, making me feel all old and unhip. 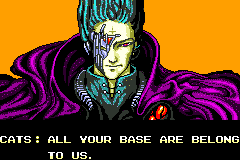 The last one I remember was All Your Base Are Belong To Us. Apparently you don’t need a poorly translated Japanese video game to attempt this sort of thing, as my friends are asking me to participate in our own grass roots phenomenon. We’re writing a meme about our strengths as writers. My three greatest strengths as a writer are 1) having had good teachers, 2) being militantly on my own side, and 3) sticking it out for the long haul. I had excellent writing teachers in college. I knew they were good teachers at the time, but I didn’t realize what an asset this was for me until recently. Not long ago a guy with an MFA started at my day job and he explained to me that writing workshops have gone out of style. A dozen years ago the workshop was the highlight of my academic experience. There may have been a few in-class written exercises, possibly even a (short) lecture or two. But in the writing classes, we mostly workshopped. My friend with the MFA explained that writing classes that focus exclusively on workshops are now generally viewed as a poor idea, because students tend to rip one another’s work apart. I can see how that would happen (especially in an MFA program). There’s someone like that in every class. In my undergraduate classes, it wasn’t so much that my teachers managed to carve out a safe place in their classrooms (they certainly did), but rather they taught us how to figure out what was working in a piece and to focus on that part. This, I think, has made all the difference. So here’s to Louise DeSalvo, Jenny Shute, Bill Root, and Donna Masini (I’m sure I’ve forgotten a few). Being militantly on your own side is a phrase I read in an Anne Lamott book, but I immediately decided to steal it for my own. To me it means sticking up for my work, no matter what the consequences. Probably the result of a lifetime of low self-esteem, here is how it works: I pretend my work (especially new work) is like the retarded little brother I never had. My work may slobber a little when it laughs, have cowlicks that jut oddly from its skull, or wear its pants pulled way up above its bellybutton. In my heart I know that each of these deficiencies will have to be looked at and objectively weighed and ultimately sorted out. That’s all okay. But nobody gets to disrespect my retarded little brother. Sticking it out for the long haul just means consistently finding time to write. Somehow I manage to find a little time each week to devote to writing. If anything, I owe Holly a huge debt of gratitude for her support. And in return I am going to tag her to write about her strengths as a writer. Tim, I love this piece, particularly the part about your writing as a little brother you never had. How funny. You must work this up as essay and submit it to a writing pub somewhere. Do you know T-Zine, the writer’s ezine? Check it out. They might like this. Another thing you can add to your strengths is your brutal honesty. You tell the history as you remember it, warts and all. Heads up. T-zine owes me a payment fsince May!!!! Normally I wouldn’t make a public announcement, but . . . pay me or I talk! But yes, Tim, this should got somewhere writers read.